Red Dead Redemption is set to introduce free DLC shortly after its release that will include co-op missions. Did I mention it's free? I love the many things in life that are free: air... okay, air is all I can think of, but air is great. DLC in the current generation has had a tendency to not be free, but when it comes to Red Dead Redemption's first DLC pack this won't be the case. Rockstar Games has announced that the game's Outlaws to the End mission pack will not cost gamers a single red, or any other colored, cent. Outlaws to the End is coming in June simultaneously to the Xbox 360 and PlayStation 3 versions of Red Dead Redemption and focuses on co-op. 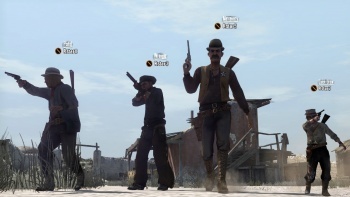 Multiplayer in Red Dead already looks pretty sweet in competitive mode, and the co-op missions only seek to increase the game's value for online players. Six missions will be added that you can play right alongside 1-3 of your cowpoke buddies (for a total of 2-4 players), providing more ways to accrue multiplayer experience points and new achievements/trophies to sharpshoot. The three missions Rockstar revealed are: Walton's Gold, a mining camp rigged with explosives that players must haul as much gold out of as they possibly can before being blown into salted pork; The River, a fun raft ride where players will be attacked by gatling gun fire on the way towards an epic battle at a weapons stronghold; and Ammunition, an assault on the town of Tesoro Azul which the Mexican Army has taken over. When it comes to Red Dead Redemption, the single-player looks good, the multiplayer looks good, and free DLC looks and feels good. However, as a grizzled, bearded man once told me in a saloon while I was having a sip of cactus wine, never count your chickens before they hatch. Rockstar says that Outlaws to the End is one of three packs to be released, but didn't reveal if packs two and three will also cost zero dinero. Red Dead Redemption is due out on May 18.